So, we have decided that to get to know Berlin better we will cycle around the course of the former Berlin Wall along the signposted 'Berliner Maurweg' cycle/walking/and inline skating path. The Berlin Wall used to run for about 160km around the border between the former Soviet controlled GDR sector of Berlin (German Democratic Republic - DDR or Deutsche Demokratische Republik in German - otherwise known as East Germany), and the FRG sectors (Federal Republic of Germany - Bundesrepublik Deutschland - West Germany) which were controlled by the UK, USA, and France. 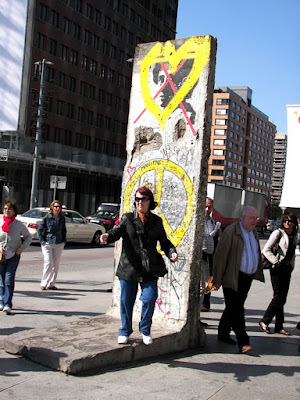 West Berlin was itself an island of the FRG within the GDR. 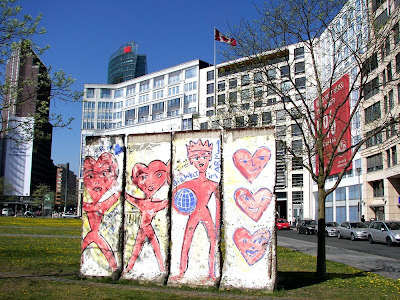 Therefore, a lot of the wall wasn't just between East and West Berlin, but between West Berlin and the East German state of Brandenburg, which is very rural and makes for pleasant cycling away from the urban built-up areas of the centre of Berlin. 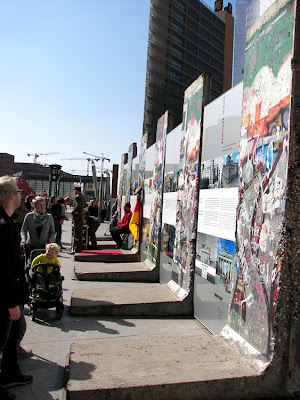 Our first leg took us 34 km or so, and we said hello to the first bit of wall in Leipziger Platz. Another three sections of the wall from here were donated to the United Nations, where they were installed outside the UN building in New York. An observation tower which once stood near here was moved a few hundred metres down the road, and we shall see that shortly. Indeed, here you can even get your passport stamped by somebody in ersatz uniform with an 'authentic' DDR visa stamp. 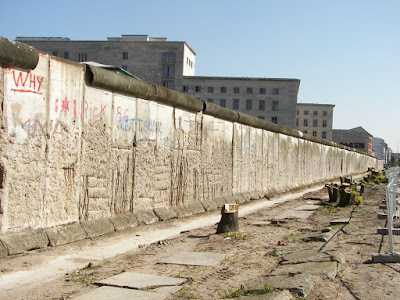 There is something not a little ironic about a wall supposedly built to protect East Germans from so-called fascist capitalism ('Antifaschistischer Schutzwall') nowadays being exploited to fleece tourists, but there you go, that's progress. And if you want your photo taken with a stencilled image of Spartakist Rosa Luxenburg it remains free. (I remember that for a while this stencil didn't have a cross through it, or a heart around it, but then it had the words 'Ich bin eine Terroristin' suddenly added to it. Such are the fluid opinions transmitted by the art of grafitti. Media Studies students please discuss). Perhaps one of Rosa Luxemburg's most famous quotes is 'Freiheit ist immer Freiheit der Andersdenkenden.' translated as ' Freedom is always and exclusively freedom for the one who thinks differently.' This quote was hurled back at the totalitarian GDR regime by dissenters who dared to think differently. Amidst all the post-cards and photo-opportunities though, there are interesting information boards which tell the story of The Wall. 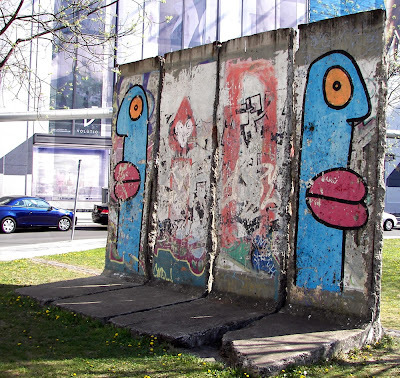 Hopefully a large enough number of people will come away with a feeling of 'never again' rather than 'Look Honey, I've got this cute souvenir authenticated piece of the former Berlin Wall to put on our mantelpiece'. (Aside: why anyone would pay good money for a lump of perfectly ordinary concrete with a bit of spray paint on it as a memento of an atrocity which divided families and caused many too many deaths is beyond my scope of imagination. And strangely, though the wall was 160 km long and three + metres high with both inner and outer barriers - therefore the potential for an awful lot of concrete - the chances of a postcard with pieces of the wall attached of being genuine are about as high as a church having a splinter of The True Cross). 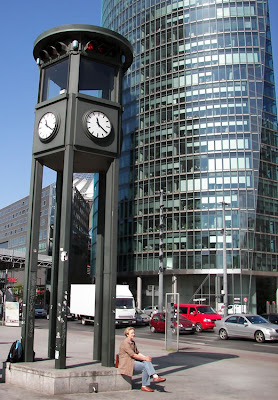 In the centre of Potsdamer Platz is a reminder that this area of Berlin was once one of the busiest intersections of the city, with a replica of what were possibly the first set of traffic lights erected in Europe. The original went up in 1924, and it is said that people made special trips out just to see the lights change colour. I know some towns in Derbyshire where that's still the main source of entertainment. This reproduction was erected in 1997 to celebrate the 150th anniversary of the Berlin electrical company that created the first, Siemens. 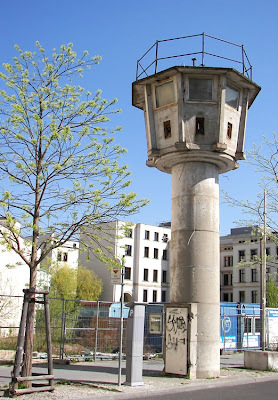 First the heavy allied bombing and shelling during the war, then the sweeping away of the rubble to make a death-strip for The Wall, made Potsdamer Platz into a deserted wilderness where the only visitors came to climb Western surveillance platforms and take a peek over the wall. Now a fascinating cityscape of ultra-modern buildings have sprung up, but the square hasn't managed to recover its pre-war importance or the buzz of activity it once had. 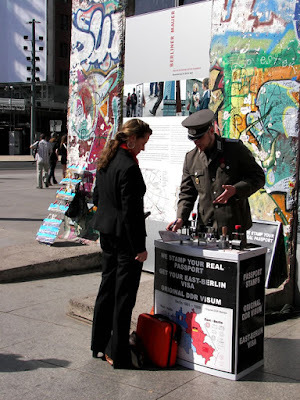 On the edge of Potsdamer Platz is one of those strange ironies which most visitors pass by. It is a plinth intended for a monument to Karl Liebknecht, unveiled on 13th August, 1951. Liebknecht was an anti-militarist who formed the German Communist Party (KPD) together with Rosa Luxenburg, and the foundation stone is located at the site of an anti-First World war demonstration in Potsdamer Platz organised by the Spartakists on 1st May 1916, for which he was imprisoned and tortured. Together with Rosa Luxemburg he was murdered by the Freikorps in January 1919, their dead bodies ignominiously disposed of, Luxemburg's in the Landwehr canal (which we'll be cycling alongside later). Liebknecht and Luxenburg later became heroes of the DDR, their names given to streets, squares, and S-Bahn stations across East Germany. 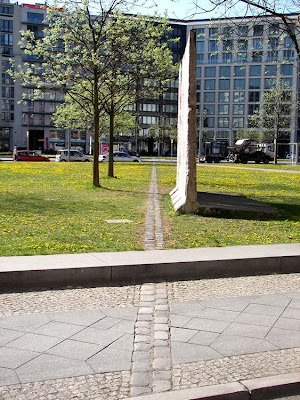 But Liebknecht's plinth in Potsdamer Platz languished un-adorned for ten years until 13th August 1961 when East German authorities began to seal off the border. Subsequently the foundation stone was left standing bereft in the border strip beside the westernmost wall, created by the very people who idolised him. What the anti-fascist, anti-war Liebknecht would have thought about the militaristic regime which gave him pin-up status can only be imagined, but I don't think he would have been too worried that the DDR never got around to erecting a monument to him here of all places. 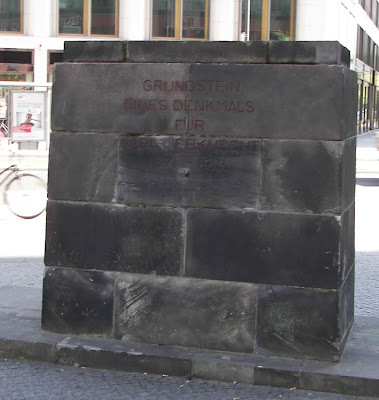 The foundation stone says: "Grundstein eines Denkmals für Karl Liebknecht 1871 - 1919"
Just around the corner from Potsdamer Platz is the Stresemannstraße guard tower, now on the end of Erner-Berger-Straße. This used to stand on Leipziger Platz, but it was probably a good idea for business to hide this symbol away down a side-street rather than distract from the advertisement hordings in Leipziger Platz. On the opposite side of Niederkirchner Strasse from the Martin Gropius Bau stands the Abgeordnetenhaus von Berlin - the Parliament building for the State (Land) of Berlin. It was originally built in high-renaissance Italianate style for the Preußischer Landtag (the Prussian Parliament) in 1899 and served as such until 1934 (Hitler had seized power in 1933, and made Hermann Goering premier of Prussia. In January 1934 a decree issued by Hitler dissolved Prussia as a political unit and it has ceased to exist ever since). 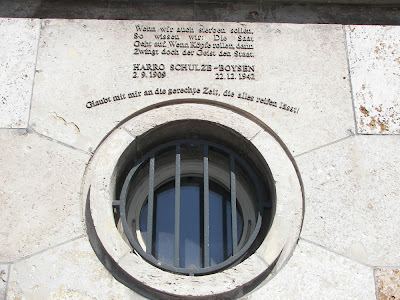 This building has seen many revolutionary events, such as the foundation of the Communist Party of Germany (KPD) on 1st January 1919 by - oh come, on you can guess by now - Rosa Luxemburg and Karl Liebnecht. 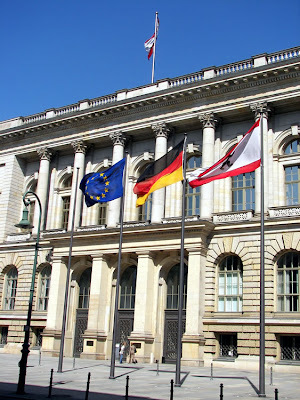 On 25th October 1990 the legislature of Berlin, which during the Cold War years had been convening in the Schöneberg town hall, voted to make its home in the Prussian Landtag after unification, which it duly did on 29th April 1993. By the way, it was from the front entrance of Rathaus Schöneberg that JFK made his famous 'Ich bin ein Berliner' speech. 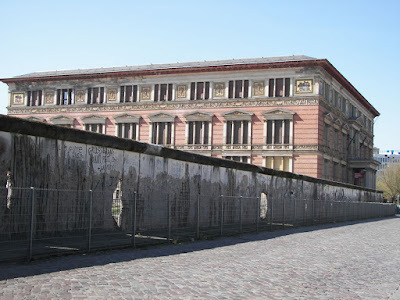 The photo below is looking the other way up the street, from the back of the wall, which is on land which was formerly the site of the building of the Nazi Gestapo, SS, and Reichsicherheitsamt Headquarters. A grim, grim place. But hey, you didn't come to this blog to look at pretty, post-card pictures did you? (You did? Okay, stick around. We'll be getting to the picturesque bits soon enough. Promise). If you really want to cheer up your day, then visit the Topographie des Terrors exhibition nearby. It documents the horrors of the Nazi state in mercilessly and mechanistically putting down resistance amongst its own citizenry, so in a way adds justification to why The Wall was erected against a paranoid belief that it was a protection against a resurgence of these kind of atrocities. If only the DDR didn't itself then recreate its own Gestapo-like state security Stasi thugs. Oh hum. Not so much 'the Iron Curtain' as the Irony Curtain. Here's a view along Niederkirchnerstraße itself. The building on the left is Göring's Air Ministry (shudder), which managed to survive the War almost intact and is now the German Federal Finance Ministry. Niederkirchnerstrasse, by the way, was previously named Prinz Albert Straße, until 1951 when it was renamed after the communist resistance fighter Käthe Niederkirchner who was arrested by the Gestapo, tortured, carried off to Ravensbrück concentration camp for women in May 1944, was imprisoned in isolation cell there, wrote secret diaries during her last days (which survived the war and were later handed over to her family), and was shot by the SS during the night of 27 to 28 September 1944. Zwingt doch der Geist den Staat." "Glaubt mit mir an die gerechte Zeit, die alles reifen lässt!" The spirit nevertheless forces the state." "Believe with me in the just time that lets everything ripen." These words are by Heinz Harro Max Wilhelm Georg Schulze-Boysen (2 September 1909 – 22 December 1942), German officer and resistance fighter with the Rote Kapelle against Hitler's fascist regime. He was murdered by the Gestapo at Plötzensee Prison. I find this monument particularly poignent in such proximity to the site of the Gestapo HQ and the so-called anti-fascist protection wall (sic). The wall continued along Zimmerstraße on the right-hand side of the street. 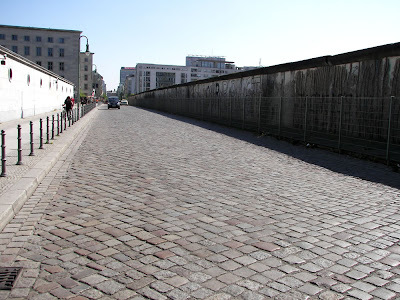 As you walk along it is worth pondering on the fact that when the wall was up, only armed patrol guards would have been able to walk along here, and that the impressive late-nineteenth century buildings lining the street would have been closed up and empty. Soon we come to the itersection with Friedrichstraße, where the infamous Checkpoint Charlie was located, and where the next part of Day 1 picks up. Great stuff; would love to read more summaries of the other parts you've toured. I'll be back just in time for the 20th Mauerfall anniversary; hope to get a highlight tour from you! 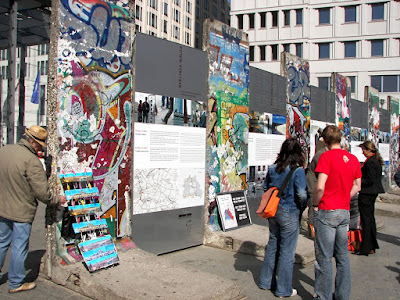 Nice post, Berlin really worth to see place, hope I would get chance to get to know more culture and history of Berlin.